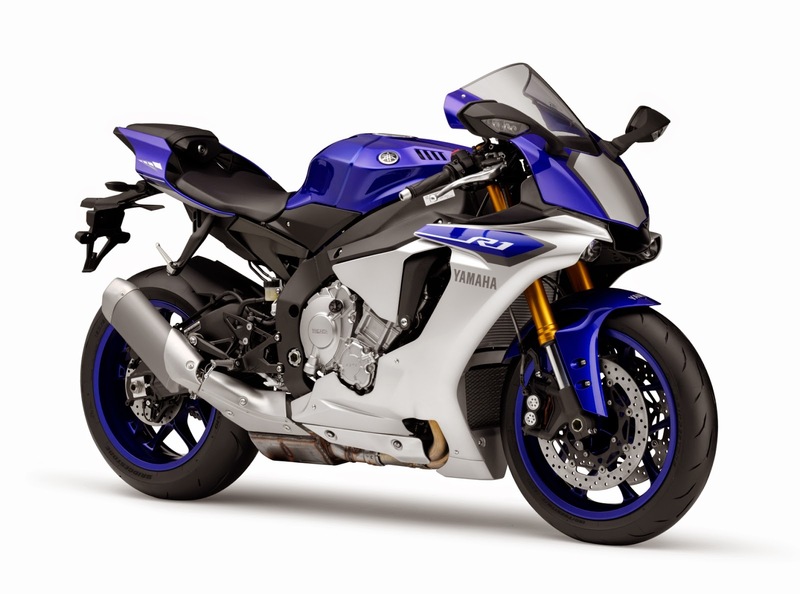 The latest 2015 YZF R1 and YZF RM1 take after Yamaha’s “High Tech Armoured Support” concept of an all-out supersport thoroughly equipped with advanced technology; allowing riders to experience the philosophy of the fastest machines on the circuit. Globally the first two commercial motorcycles to boast of a 6-axis position sensor detecting 3-axis angular velocity and and 3-axis acceleration, they also come with Yamaha’s sophisticated sensor, delivering high dimension handling and performance, devoting the driver’s attention to pure riding. Assimilating the YZR-M1 Moto GP’s features has led to an entirely new R-DNA based on Yamaha’s speed racer concept, combining a miniscule silhoutte rider-machine utility and haedlight-less front face. The high end YZF-R1M also stakes claim at electronically controlled suspension, lightweight carbon fairing and a digital interface that records valuable racing information. 1) New engine developed around the concept "High tech armed Pure Sport"
The newly-designed engine, featuring a 998cm3 liquid-cooled, 4-stroke, in-line four- cylinder, 4-valve system with a cross-plane crankshaft, incorporates design to substantially "increase air intake volume" and "reduce horsepower loss". This new engine achieves maximum power of 200PS, an increase of approximately 18PS over the current R1 model. Yamaha Motor's engineers implemented weight reduction technology throughout the new model to lighten it by approximately 4kg. In addition, the engine width is reduced by 34mm. The FS titanium connecting rod contributes to reducing both weight and loss of horsepower. Lightening the connecting rod, which works to link reciprocating and rotating motion, has led to weight reduction of the engine overall. Additionally, assembly using the FS method (Fracture Split) ensures high circularity at the large end, thereby supporting superior performance in the high revolution range. The connecting rod is made with α + β titanium alloy, which strikes a good balance between weight, strength, and processability. Lightweight cast magnesium wheels contribute to superior riding performance. Mass production of magnesium wheels has long been considered difficult due to the complex casting mold required for the hubs, spokes and rims. However Yamaha Motor have successfully developed production technology that makes mass production possible. An aluminum fuel tank (17L capacity) has been employed to secure weight reduction and riding position flexibility. Using Yamaha Motor's unique processing technology, the deeply sculpted knee pocket is pressed into shape and finished with the latest welding technology and coating techniques to combine an excellent knee grip with stylish appearance. For the YZF-R1M, each fuel tank is carefully buffed by hand before coating with a clear paint, thus further highlighting the unique texture of the aluminum. The two models employ meters developed to act as an interface between rider and machine. The display functions are collected together on a 4.2 inch screen of fully transparent TFT (Thin Film Transistor) LCDs. The full screen is a digital display, but leverages the minimum unit level dot display to create a "bar display tachometer", accelerometer and brake pressure displays etc. that give a similar visual impression to analog meters. The rider can select from two different display modes: "Street", which is tailored to travel on public roads, and "Track" which prioritizes the information displays required for race and circuit riding. The two models are fitted with a 6-axis IMU (Inertial Measurement Unit) and five types of control systems. The IMU comprises a gyro sensor that detects rotational motion in the “pitch”, “roll”, and “yaw” directions, and a G sensor that detects the velocity in the "forward and back", "up and down" and "left and right" directions. The calculated vehicle position information obtained from these two sensors, such as the bank angle, pitch rate, and sideways slide acceleration, is sent to the ECU to be reflected in the sequentially optimal output. This ECU is programmed with the following five types of control systems: (1) a new TCS that also conveys bank angle information (traction control), (2) an SCS that reflects sideways slide of the rear tire (slide control), (3) an LIF that deters loss through wheelies etc. (lift control), (4) an LCS that supports the quick takeoff required in racing (launch control), and (5) a QSS that supports fast gear shift (quick shift). 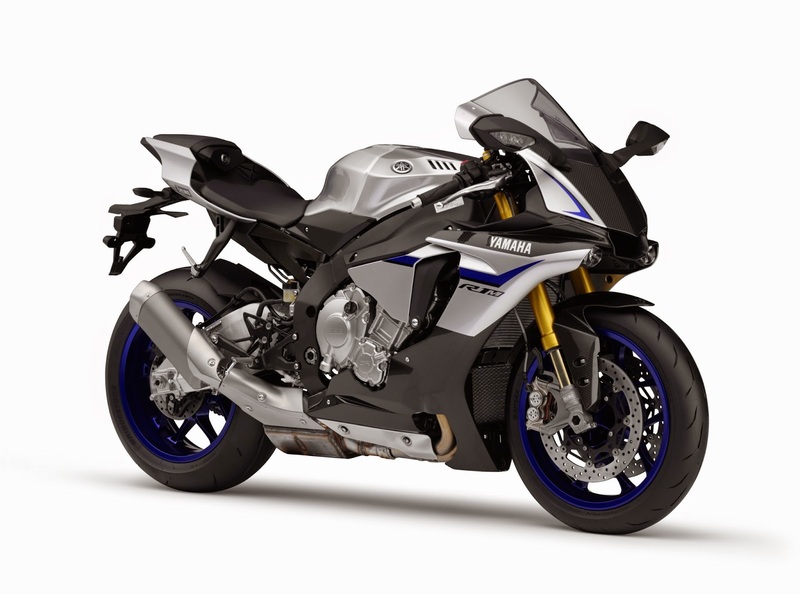 ÖHLINS electronically controlled suspension and ERS (electric racing suspension) are used with the YZF-R1M to further draw out potential for on-circuit performance. The SCU (suspension control unit) supports riding through integrated control of the front and rear suspension extension/compression damping force based on information from the IMU and sensors. In addition, this model employs features such as lightweight highly-textured carbon fairing, data logging functionality that records riding conditions, and 200mm wide rear semi-high grip tires. A CCU (Communication Control Unit) is employed to heighten the rider/machine interface through simplifying the settings and checking the vehicle information. Comprised of a CCU unit and GPS antenna, it enables recording of the riding conditions through logging functionality, and automated circuit lap time measurement using GPS. It is also possible to create settings data on smart phones via an application that can be downloaded to any Android-based smart phone. Based on the “Speed Racer” concept, the new models have a light, slim, and compact look. This is achieved primarily by emphasizing horizontal lines and minimizing the surface area of the fairings. The new fairing shape features the cross-layered wing – an aerodynamic characteristic which allows airflow to cross between the inside and outside of the fairing. The front face of the new models inherits the twin-headlight configuration found in the R-series of the past, yet it bears a strong resemblance to YZR-M1, thanks to the design that obscures the presence of the headlights and the allocation of a center duct. In addition, fairings and screens with a raised center combine with the wide seat to create an entirely new R-DNA which incorporates the essence of the YZR-M1.